White privilege is entrenched in our society, and not where it might be expected. Many people who consider themselves “not racist” act in ways that are still oppressive. Racism and oppression are as much “ways of being” as “words” that are said. I was surprised that I have a history of being an oppressor as I look back over my life and I grapple with my own white privilege every day. If you prefer to download and read the paper as a PDF, here is a link. When I first encountered this article (“Unpacking the Invisible Knapsack” by Peggy McIntosh) in Multicultural Perspectives in Art Therapy last year, I had no awareness of white privilege, or the extent to which I was a participant and oppressor. It was truly eye opening and life changing. And it was terrible, and in its terribleness, I began to see that my pain, while real and legitimate for me, was nothing compared to the lives of those who live in oppression as a result of white privilege. Until then, I thought we were all the same and equal. It was what I had been taught, and it was what I had experienced. I had gone from high school dropout to college professor. What could be so hard about getting out of the ghetto? (I used that phrase on purpose, bear with me…) I had no idea that this was a privileged worldview, nor how racist it was at the heart of it. Having lived in a homogeneous world of white privilege for all my life, I took the “reality” of what the dominant culture was feeding me and assumed it was true and that racism was a relic from the 1960s. I also assumed all black people lived in urban areas, which on good days, my mom called the “ghetto.” I won’t repeat what she usually called black neighborhoods, and THAT was what I grew up thinking was racist. Certain words. Not ways of being… Now I can see how privileged and small that view of the world is. When education is the factor, the results are even more substantive, as shown in the graph to the right, also from the same website. 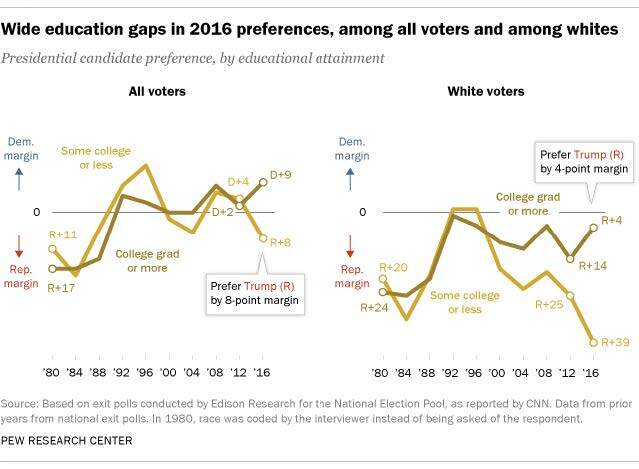 Of course, these are exit polls, and not academic studies, but the evidence of the election outcome shows why “Unpacking the Invisible Knapsack” is so very important. There is a clear racial divide in this country, and while a fair number of white people I know consider themselves to not be “racist” the fact that so many of us are oblivious, and even willfully ignorant, to our privilege, is very troubling. 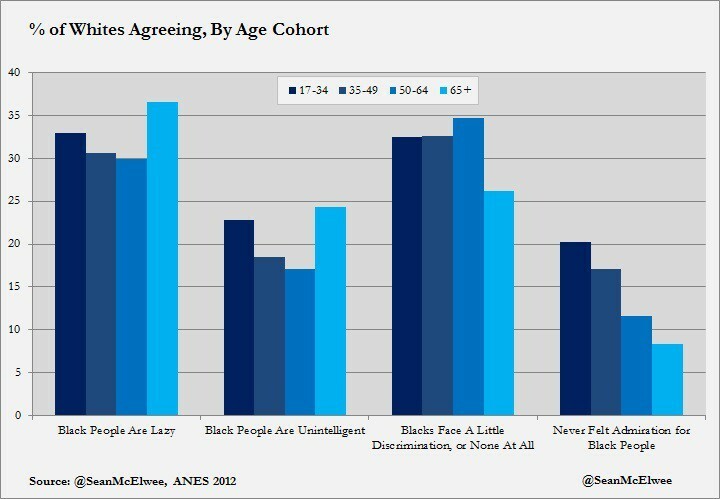 PBS article from March 2015 (based on data from 2012) is something I find to be very troubling, showing the attitudes of “Millennials” toward blacks and whites on certain issues. 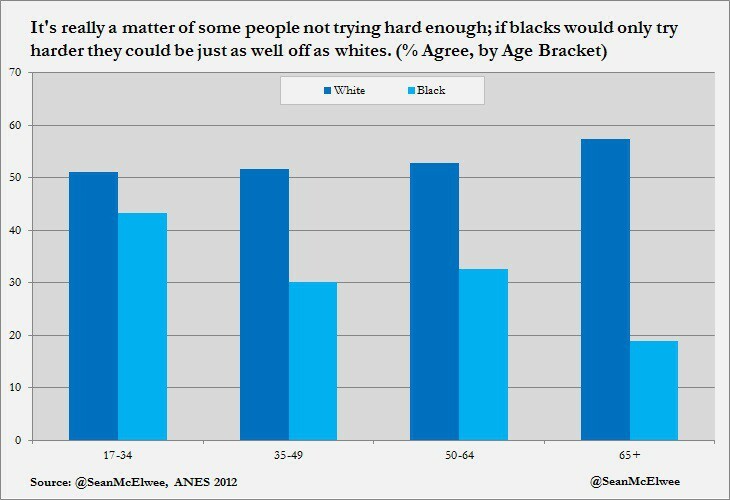 The graphs in blue are from the link above, and very, very troubling to me. 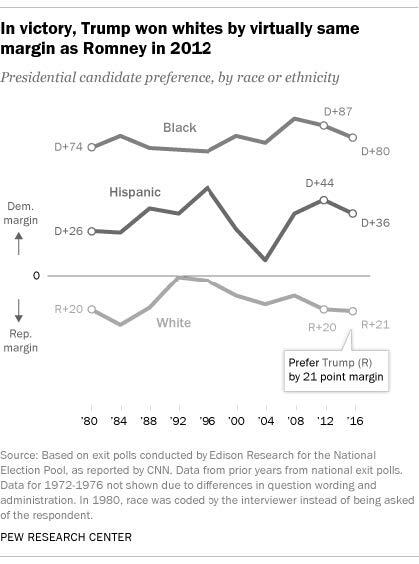 This data proves to me that the problem is far less about any one issue, but instead a foundational belief system rooted in a variety of issues, which is exactly what the article we read indicates. When the basis of a society is so skewed toward one group of people as the “cultural norm” it will infuse all aspects of that which is controlled by the group in control. not having it be a reflection on my race; I was just “weird,” but it was centered on me, not my lineage. Any oppression I might have faced was centered on me as a person, not me as a white person. the various things I have read and experienced lately, and from the current state of our country, many people find it easier to turn a blind eye and ignore anything that is uncomfortable. Many WHITE people, that is, because we have that option. For those who are on the other side of white privilege, ignorance is not an option. It is impossible to ignore the oppression that calls the integrity of an entire race of people into question merely because of how you look. 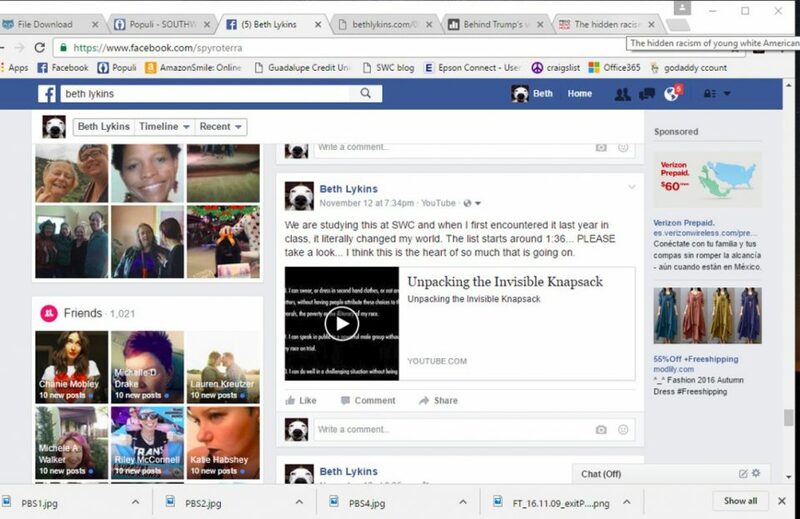 I was so moved by this reading that I found a video on Youtube of it (the one at the top of this blog post) to share with my friends on Facebook (knowing people won’t read an article,) and I was shocked by the number of interactions I had with this post, as you can see in the screen shot below. I have over 1,000 friends, and I set the privacy settings to “Public” so anyone could see and share it. A funny picture of a cat I posted got over 200 responses once. This? Nothing. Really? It is not ignorance but rather apathy that is the greatest roadblock to unpacking the invisible knapsack. And apathy is the biggest white privilege of all… The issues we face in this society are monumental and very, very entrenched, and sadly, quite invisible to the oppressors, either by choice, apathy, or ignorance. White people tend to be focused on things that comfort and entertain us, but at whose expense?